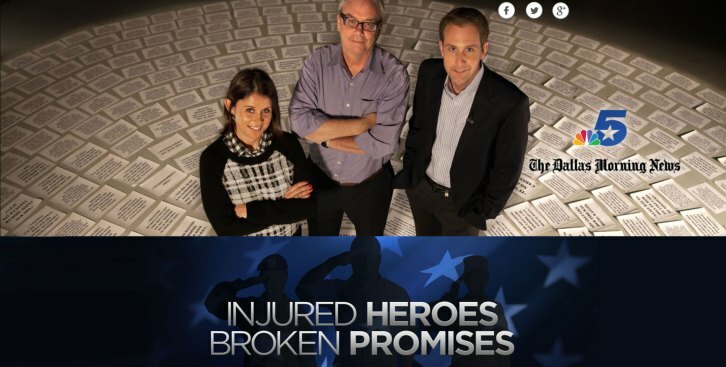 "Injured Heroes, Broken Promises" uncovered complaints from hundreds of injured, active-duty soldiers claiming they were mistreated, harassed and verbally abused by commanders of the U.S. Army's Warrior Transition Units, or WTUs. These units were created to improve care for injured soldiers after the 2007 Walter Reed Army Medical Center scandal. Just nine days after the first NBC 5 report aired and appeared in The Dallas Morning News, the Army issued orders requiring staff at all 25 of the Army's WTUs located worldwide, to undergo new training. Texas story with national implications that has helped many soldiers. We couldn't be prouder of these journalists." The NBC 5 Investigates team led by Reporter Scott Friedman along with Producer Eva Parks and Photographer/Editor Peter Hull was joined by Reporter David Tarrant of The Dallas Morning News. This is the second time the NBC 5 Investigates team has won the Sigma Delta Chi Award since the group formed three years ago. The Society of Professional Journalists has offered the Sigma Delta Chi Awards for excellence in journalism since1932 and will present the award to the NBC 5 Investigates team at the National Press Club in Washington, D.C. in June 2015.